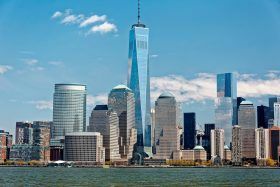 It was recently revealed that One World Trade Center still has a 25 percent vacancy rate four years after opening its door, and that number is about to grow. The first tenant to move into the building in 2014, Condé Nast is now looking to sublease a third of its one-million-square-foot office space. As part of its consolidation plan, the media company on Monday said it’s looking to sublease seven of the 23 floors it currently rents as a way to cut costs, according to the New York Post. 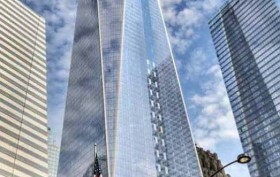 It’s estimated Condé Nast paid roughly $50 per square foot when it moved in nearly four years ago–space at One WTC is now worth $75 per square foot. Remember those jitters you’d get leading up to college move-in day? We wonder if Condé Nast is feeling that way in anticipation of its big move into One World Trade Center, now set for November 3rd. The tower’s anchor tenant will not make a big to-do of its move, but the Port Authority of New York and New Jersey is planning a celebratory event later in the month following the fall elections. The exact date will be determined based on Governor Cuomo’s and Governor Christie’s availability. 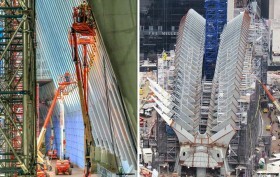 The official open date of the city’s tallest building comes more than nine years after ground was first broken. Though Condé Nast will begin relocating its offices next month, it will not complete the move until January. Other tenants include Morgan Stanley, Legends Hospitality, and BMB Group. As many of you architecture buffs know, One WTC now rises a symbolic 1,776 feet, making it the tallest building in the Western Hemisphere and the third tallest in the entire world. Designed by renowned architect David Childs of Skidmore, Owings and Merrill, it also has a LEED Gold certification and is the most environmentally sustainable project of its size. After a temporary real estate slump, the 104-story, glass and steel building is now 56% leased, with big-time tenants like Conde Naste, Morgan Stanley, Legends Hospitality, and BMB Group. Eight years after construction began, One World Trade is at an exciting juncture with its tenants expected to move in by the end of the year, already beginning to build out their office spaces. The original crew of 10,000 has been reduced to 600, and we’re checking in on what these remaining workers are up to.